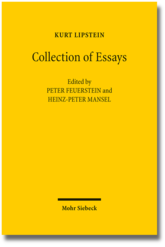 Peter Feuerstein and Heinz-Peter Mansel have edited a “Collection of Essays” by Kurt Lipstein, a German law professor who emigrated from Germany to England in 1934. This collection contains a selection of essays by the late Professor Kurt Lipstein, who emigrated from Germany to Cambridge in 1934. It focuses on his central works on the general principles of private international law, which are characterized by his comparative approach and his attention to the many relationships between conflicts of law and questions of public international and European law. It includes Lipstein’s first studies of the conflict of laws as well as his powerful Hague lecture on the basic principles of private international law and his influencing articles on the development of the conflict of laws through international courts and arbitral tribunals.